ATLANTA (AP) With a chance to win the game, Kent Bazemore wasn’t the first option for the Atlanta Hawks. He wound up with the ball – and it worked out just fine. Bazemore swished a jumper over Anthony Davis with 2.1 seconds remaining and the Hawks rallied from 19 points down to beat the New Orleans Pelicans 94-93 Wednesday, thrilling a sparse crowd on an icy night in Atlanta. The Hawks wanted to go to Ersan Ilyasova in the corner, but the Pelicans thwarted that play. So Dennis Schroder passed instead to the 6-foot-5 Bazemore, who feigned a drive before pulling up from 18 feet to hit the shot against the 6-10 Davis. It was a tough night for Davis, who was held to just eight points on 2-of-8 shooting – one night after scoring 45 points in a big win at Boston. Tied at 92, DeMarcus Cousins drew a blocking foul on rookie John Collins with 13.7 seconds remaining, earning a trip to the foul line. Cousins made only one, giving the Hawks a chance to pull out the victory. New Orleans had one last chance, inbounding the ball to Cousins near the hoop. He came up short on a quick shot, pleading with the officials for a foul call while the Hawks celebrated. 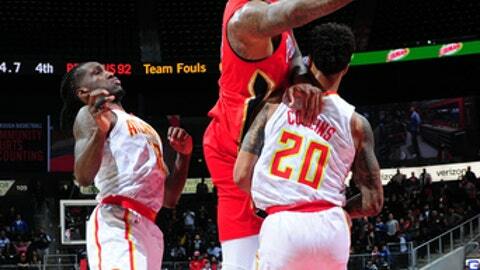 Bazemore led the Hawks with 20 points, Collins added 18 and Schroeder had a double-double – 13 points and 15 assists. Jrue Holiday paced the Pelicans with 22 points, while Cousins had 19 points and 14 rebounds. Coming off a victory over San Antonio, the Hawks won back-to-back games for only the second time this season and snapped the Pelicans’ three-game winning streak. Atlanta missed seven straight shots during two different stretches in the first quarter and endured another long drought at the beginning of the second, going nearly 5 minutes without a field goal. New Orleans ripped off 12 straight points to erase an early deficit and led three times by 19 before settling for a 60-45 lead at the break. But the Pelicans made only 3 of 18 shots in a 10-point third period, allowing the Hawks to grab a 71-70 lead heading to the fourth. The game was played after a winter storm moved through the Deep South, leading most schools and businesses in metro Atlanta to shut down for the day because of treacherous roads. The upper deck wasn’t even used, allowing everyone in the estimated turnout of around 5,000 to watch the contest from the lower level. The announced attendance was 10,894, the smallest crowd of the season at Philips Arena. The Hawks came into the night ranked last in the league with an average attendance 14,239 – more than 1,300 less per game than the next-lowest team, the Indiana Pacers. Pelicans: Davis was held below 13 points for only the second time this season. The first came in an October loss at Portland, when he played only 5 minutes and scored two points before leaving with a knee injury. … New Orleans missed is first eight shots of the second half and finished with a season-low 33 points over the final two quarters. … Darius Miller made 3 of 4 beyond the arc and ended with 17 points. Hawks: C Dewayne Dedmon fouled out with 4:48 remaining after grabbing 10 rebounds and helping shut down Davis. … F Luke Babbitt, who was on the inactive list, hasn’t played in five straight games. In fact, he’s gotten in only two of the last 13 games after making nine starts early in the season. … Ilyasova had 15 points on 6-of-9 shooting, including 3 of 4 from 3-point range. … It was Atlanta’s biggest comeback of the season. They had rallied from a 17-point deficit in a Nov. 24 victory over the Knicks. Pelicans: Return home Saturday to face the Memphis Grizzlies. Hawks: Continue a six-game homestand by hosting the Chicago Bulls on Saturday.